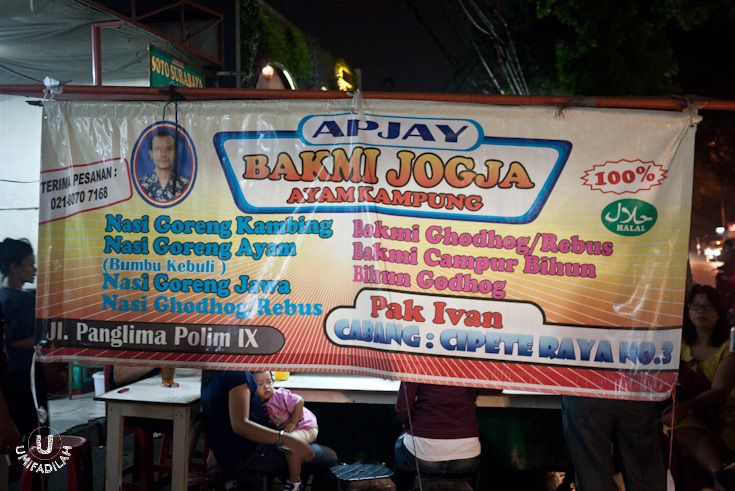 This time, my addiction goes to Bakmi Jogja Apjay Pak Ivan, Panglima Polim. Even though it's popular for their Bakmi Jawa, I got totally hooked by their “Nasi Goreng Kambing Bumbu Kebuli” and "Bihun Godhog" instead. The original vendor is located at Cipete Raya No.3 but since their branch at Panglima Polim is closer for me to reach, I’d go there every time I’m craving for them. LET’S TALK ABOUT THEIR NOODLES FIRST. The main menu being sold here is actually a typical Jogjakarta noodle dish called “Bakmi Godhog” (boiled noodle in thick chicken & egg broth with lots of veggies). Other version is of course, “Bakmi Goreng” (Fried Noodle). You can also substitute the noodle with Bihun (bee-hoon, vermicelli) or even combine both type in a single bowl. Bakmi Godhog – IDR 18.000. 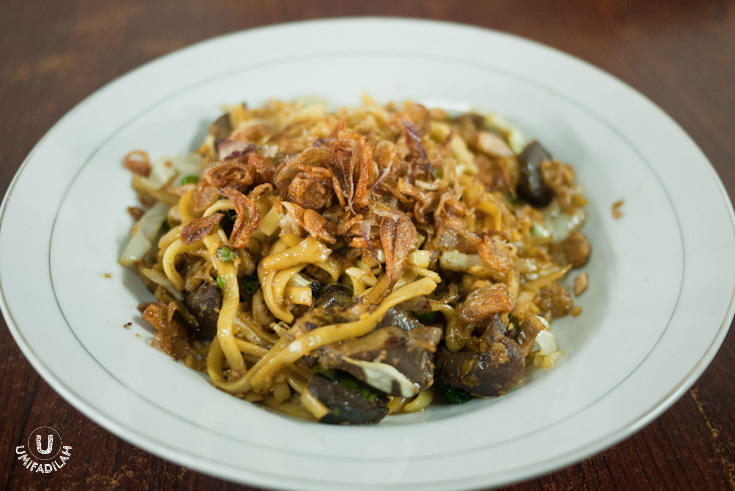 If you’re used to eating Javanese noodle, you’ll notice that this version has a slightly wider noodle. Slurping the broth is essentially what makes this dish a comfort food for most people in Java. Even if this one’s not as authentic as the ones in Jogja (there they use traditional wood & charcoal method for boiling the broth), I’d say it’s still a strong contender. They use local free-range chicken, resulting in a richer, tastier soup. Bakmi Goreng – IDR 18.0000. When you’re not quite in the mood for something soupy, there’s nothing wrong to order this one instead. They skilfully tossed the wide-noodle along with other spices & ingredients on high heat, and you can also order additional chicken liver/gizzard for IDR 5.000. Bihun Godhog – IDR 18.000. I have to say that I LOVE their Bihun version better than the noodle. The vermicelli looks slightly wider too, not as thin as the ones we found in Bakso (starchy meatball soup). It’s almost as if I’m eating Vietnamese vermicelli, you know. It takes the whole slurping effect to another level of gluttony. Oh, and don’t forget to request additional broth because it’s just so damn tasty! MUST TRY. 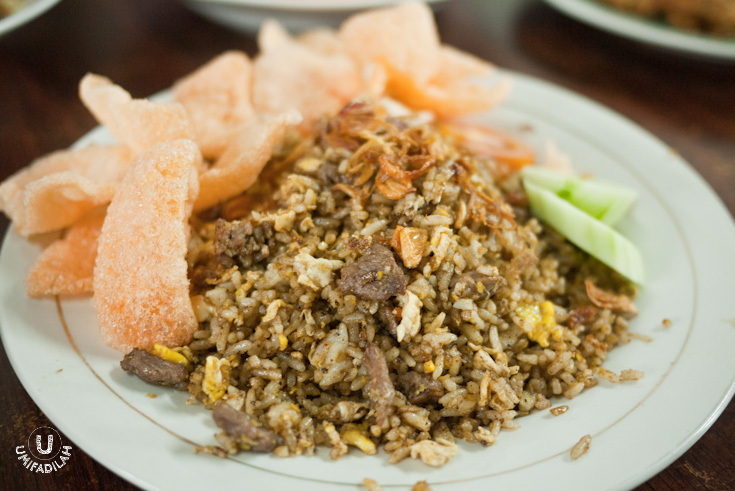 At IDR 22.000, this Lamb Kebuli Fried Rice is everything I’d wish for whenever I get really hungry and feel like eating a meal that’d give a complete satisfaction. For that price, the amount of lamb chunks is surprisingly generous. The meat is twice-cooked, the latter cooking process ensures that the marinating Kebuli spices blend well enough to cover every grains of rice. You can taste the strong wok-hei aroma coming out of the dish – the slightly burnt aroma post tossing ingredients in high-heated wok. The complex Kebuli spices are not overpowering, everything’s just lovely. If you love fried rice, then you just gotta give this a try! You can also order additional Fried Egg (IDR 3.000) to go along on top of your Lamb Kebuli Fried Rice. I intentionally ordered mine to keep its oozing yolk effect, it was just… heavenly. THIS IS EXACTLY WHERE MY ADDICTION BEGAN. 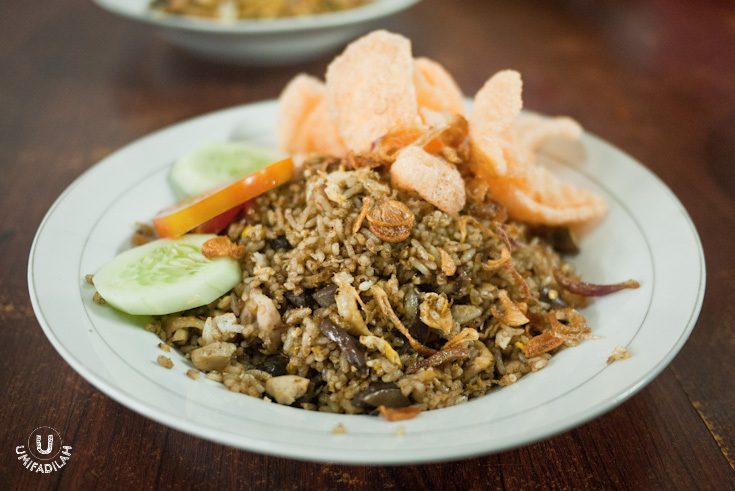 Nasi Goreng Ayam Bumbu Jawa – IDR 18.000. Traditional Javanese fried rice with standard chicken topping (+ additional chicken liver & gizzard). I suggest if you order this, crank up the heat of your taste bud with special request to add lots of bird-eye chili. Works really really well (for me, haha). Nasi Goreng Ayam Jawa (Campur Mie) – IDR 18.000. It’s basically the same as the previous one, except that this dish also incorporate strands of noodle into the fried rice. In Java, we called it “Nasi Goreng Magelangan”. It’s for people who could not decide whether to have fried rice or fried noodle, so it’s a win-win. For me? Not so much. Their Lamb Kebuli Fried Rice wins over anything on the menu! If you're looking for some snack-in-between, beside Bakmi Apjay there's also a Martabak street-vendor. This savory egg pancake with ground beef & scallions is great for munching! - IDR 28.000 (regular). To close off the night, for maximum street-food experience I’d recommend you to try their “Wedang Uwuh” (IDR 5.000 only!). This piping hot beverage, literally means “trash drink”, comes in a bright red color as a result from spices called "secang"; along with whatever ingredients stuffed at the entire glass. I see cloves, cinnamon, lemon grass, nutmeg, ginger, cardamom etc. Very recommended. WOULD I COME BACK HERE AGAIN? Absolutely. Already did, several times. 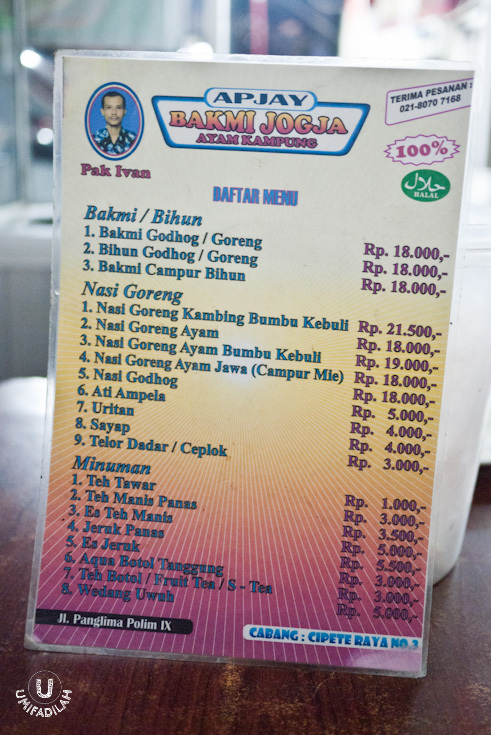 Tried almost everything on their menu except for Nasi Godhog (boiled rice in chicken & egg broth) – should taste awesome too, I suppose. I’d like to think of this place as a great option to have cheap & satisfying meal. Great findings, really. Jl. Panglima Polim IX, right in front of Alfa Midi minimarket. Next to Mama Goose restaurant. Opens every day starting 5pm onwards until they ran out of stock.